Drivers on Forest Avenue in Fort Fairfield navigate snow drifts in the road around 8 a.m. Wednesday. 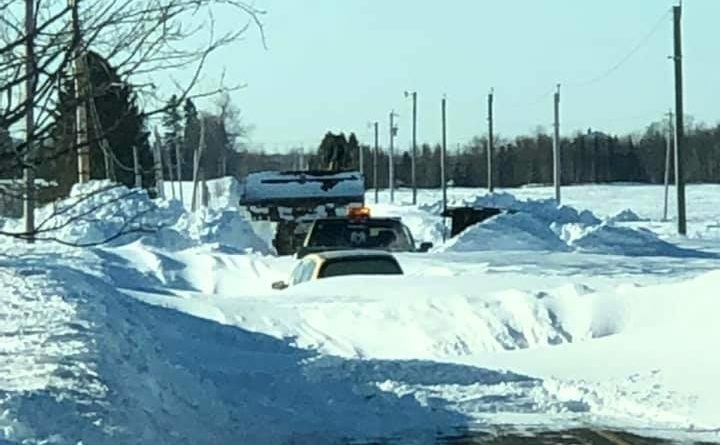 The combination of fresh powder and sustained winds Tuesday created some of the most challenging winter road conditions in Aroostook County’s recent memory. “It was like nothing that I’ve ever seen before in the years I’ve been doing this,” Maine Department of Transportation Region 5 Manager Bob Watson said Wednesday of the weather that closed schools, businesses and roads. Watson said the transportation officials will be spending the rest of the week cleaning up snow drifts, and urged drivers to be both vigilant and patient. The cold temperatures and wind chills are expected to moderate Thursday into the weekend, with high temperatures in the 20s by the weekend, according to the National Weather Service. While the white out conditions led to crashes, including a totaled Presque Isle police cruiser, and stranded drivers, none appeared to have left people with major injuries. Aroostook County Sheriff Shawn Gillen said his office received more than 300 calls related to 20 crashes Tuesday. “Three of those accidents were personal injury accidents that required ambulance transport. None of those were life-threatening though,” Gillen said in an email. Only one crash involved a single vehicle, while the rest involved anywhere from two to nine vehicles, he said. In Presque Isle, where 10 local roads were closed at various points Tuesday, a police officer’s cruiser was struck from behind while the officer was attending to the scene of a crash. The cruiser was totaled while the officer “walked away with only minor injuries,” according to the police department. In Caribou, where city offices were closed Wednesday, officer Craig Peterson said that, between crashes and stranded motorists, Caribou police have handled roughly 25 incidents related to the weather. He added that while the police have have previously handled this number of incidents in a single day, it’s not exactly a common occurrence. Police are recommending that the public avoid traveling if possible, and to be cautious if driving anywhere Wednesday. For the Transportation Department’s Region 5, which covers all of Aroostook County and portions of Penobscot, Piscatiquis and Washington counties, Tuesday’s weather and this winter in general has stretched the winter budget and highlighted the need for more windbreaks, Watson said. The agency’s Region 5 has a crew of about 180 people for snow and ice control and a winter budget of about $10 million, Watson said. “We’re a little behind on our budget from what we’d like to be,” he said, adding that the agency may postpone some spring duties until the new fiscal year in July. Aroostook Republican & News writer Christopher Bouchard contributed to this report.